In the modern, pass-happy NFL, the role of edge rusher has grown increasingly important. The premium players at the position can dictate the game on a whim, and teams will always covet a dominant edge player who can change the game on just one won pass-rushing snap. This year’s edge class is stockpiled with upper-echelon talents for teams to pursue, highlighted by the fact that the top-three players on this list combined for 221 quarterback pressures throughout the season. Here are PFF’s top-10 free agent edge defenders. 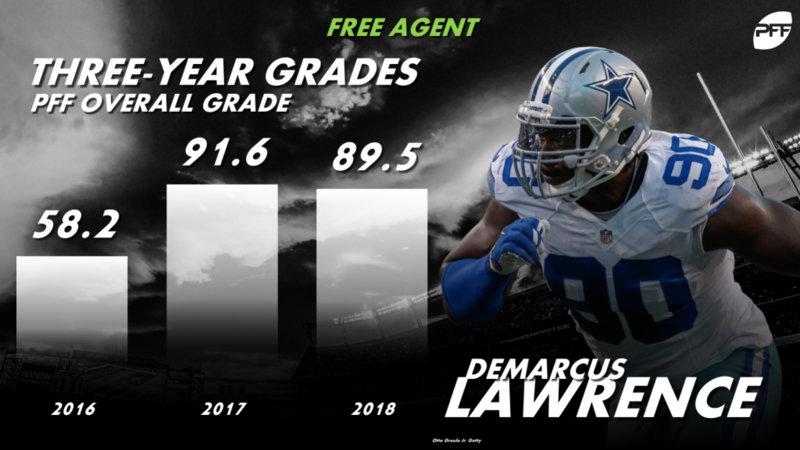 Playing this season under the franchise tag, Lawrence backed up his dominant 2017 season where he generated an elite-level overall grade of 91.6 with another premier year setting the edge on the Dallas defense. Including the postseason, Lawrence notched an 88.0 overall grade in 2018, tied for ninth among edge rushers, while his 49 defensive stops were third-most at the position. Validating his consistency, the former Boise State product led the league in games with three or more pressures, earning that in 14 of his 16 regular season games played. Lawrence is going to be highly coveted as one of the best all-around edge defenders in the league – a player of his caliber doesn’t hit free agency very often. Flowers has improved in each of his four seasons since being drafted in 2015. During his Super Bowl-winning 2018 season, he put his versatility and disrupting ability on display to the tune of 78 total pressures, tied-for-second most among edge rushers, and 43 defensive stops. As great as Flowers has been as a pass rusher, he’s been just as good against the run, with his 10.5% run stop rate ranking fourth at the position. Flowers lined up all over the New England defensive line with only 57.3% of his pass rushes coming from the left side of the front. The fourth-year player is a young, do-it-all edge defender and could be a finishing piece to a building defense. The Patriots don’t always break the bank when signing free agents, but they would be wise to re-sign him. As a balanced and somewhat underrated edge rusher, Graham enters free agency following five consecutive seasons of overall grades at 80.0 or higher. He’s thrived in getting after the after quarterback by completing his third-straight season with 77 or more pressures. His 88.1 overall grade this season was good enough for eighth-best among edge defenders, and while he’s at his best when rushing the passer, he also offers tremendous balance against the run. Even at age 30, Graham remains a versatile player that can be a prominent factor in any team’s defense. Clowney enters free agency after his best year in the NFL thus far, but could be a strong candidate for the franchise tag with the Texans for the 2019 season. He finished in the top 10 among edge defenders in overall grade at 88.0, by far the highest of his career, and his 91.2 grade in run defense (second-best at the position) was a major reason why. The former South Carolina standout concluded his 2018 season with 63 total pressures, and his 31 run stops were good enough for fifth-best among edge defenders. Although he performed at a high level, it’s scary to think there is still room for improvement. Clowney’s aggression got him into penalty trouble last season as he was flagged 14 times this season, which is the most among all defenders this season. 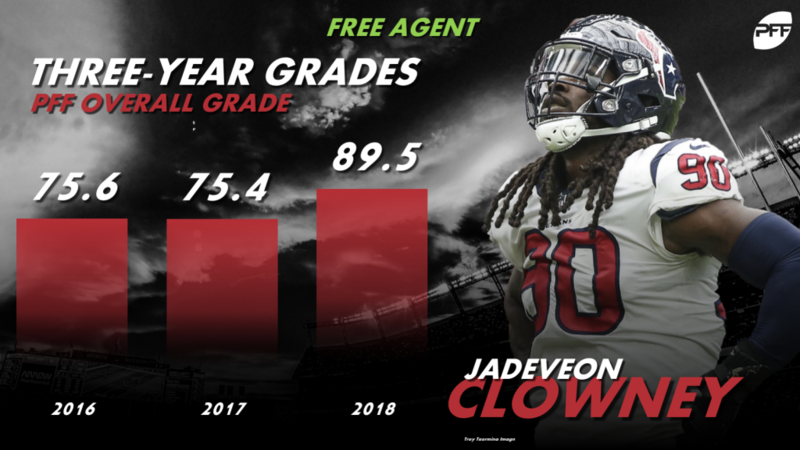 Despite that slight flaw, Clowney seems to be hitting his stride and will command top dollar in free agency if the Texans allow him to get that far. Before hitting the age of 26, Clark has now generated three straight seasons with 50 or more pressures from the edge. Displaying his consistency, the fourth-year Michigan product notched multiple pressures in every single game this season and is a safe target for teams looking to upgrade their pass rush for next season and beyond. Clark listed at 18th overall at the position with an overall grade of 77.4, which wasn’t helped by his most glaring flaw of the 2018 season – missed tackles. In 40 tackle attempts, Clark missed on 13, second-most among edge defenders. 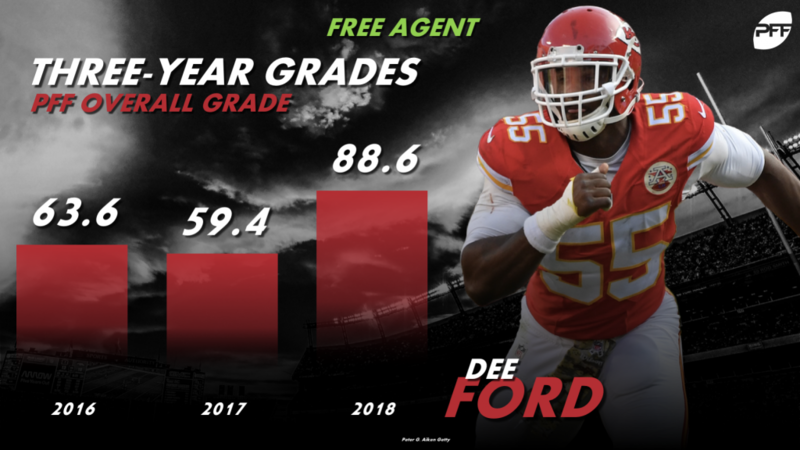 As a contract-year breakout star in 2018, Ford enters free agency as a high risk/high reward potential signing for teams looking to upgrade their pass rush. In his four seasons from 2014-2017, the fifth-year edge rusher recorded 44 combined quarterback hits and sacks. In 2018 alone, Ford generated 35, and his 84 total pressures were the most at the position. His overall grade of 87.7 this season was 29.9 points higher than his overall grade average from his first four seasons and was helped by his position-leading 91.1 grade in rushing the passer. Similar to Demarcus Lawrence’s prove-it situation from a year ago, Ford looks to be a prime candidate for the franchise tag. After signing the one-year, restricted free agent tender for $2.9 million, edge defender Shaquil Barrett saw his opportunities decline in 2018 after the Broncos spent the fifth overall pick on Bradley Chubb. This season, Barrett produced only 13 total pressures on a career-low 127 pass-rush snaps. However, for teams looking at Barrett’s upside when given the opportunity, he could be a free agent steal. He’s just one year removed from a career-high 82.6 grade and 43 total pressures from 324 pass-rush snaps in 2017. Smith is an under-the-radar free agent this offseason that has increased his performance throughout his career. This past season, his 76.9 overall grade was a career-high, and he increased his pressure totals each of the last two seasons to 53 in 2018, tied for 24th among 109 edge defenders that logged 250 or more snaps this season. He’s also proven his durability by playing over 2,300 snaps over the last three seasons and 834 this past year. Smith is a name to watch as a potentially sneaky signing that could offer high-level production and a high return on investment. 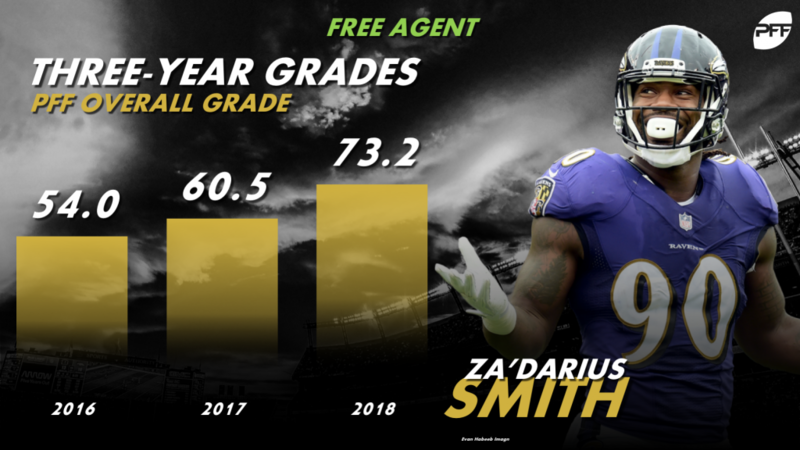 Similar to Preston Smith, Za’darius Smith is another under-the-radar edge defender in a deep free agent class. He’s increased his productivity as a pass rusher in each of his seasons since being drafted in the fourth round in 2015 out of Kentucky. This season, Smith’s 61 total pressures ranked 19th at the position, with 27 resulting in quarterback hits or sacks. Although he doesn’t offer much in run defense, Smith’s pass-rushing ability can’t be overlooked. His 78.7 pass-rush grade listed inside the top 15 among edge defenders, and as the game continues to evolve, he could be a bargain for a team looking to upgrade their ability to harass the quarterback. Ansah will surely hit the free agent market this offseason after the Lions franchised their sixth-year edge defender a year ago. In return, he only produced 20 pressures on 110 pass-rush snaps en route to a 74.5 overall grade in an injury-shortened 2018 season. Drafted in 2013 out of BYU, Ansah will be 30 next season and hasn’t notched 50 pressures in a season since 2015. Even so, the sixth-year edge rusher will get a lot of looks in free agency, and if he can prove he’s back to 100 percent health, could add value as an above average pass rusher next season.